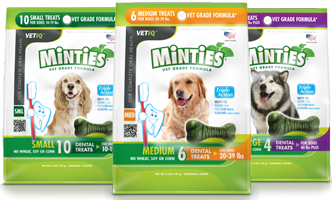 Right now you can get a FREE Sample of Minties Dental Treat for Dogs! We want every dog to try delicious Minites dental treats, and every owner to experience the benefits of Minties triple action formula. Minties are free if wheat, soy, and corn, and clean teeth, freshen breath, and remove plaque and tarter. Fill out the form below, and we'll send you a free sample in the mail for your dog to try along with a valuable coupon that can be redeemed.